When I say “ni hao” to a Chinese speaker in Vancouver, no one cares. Anyone can say “ni hao.” But when I say “wo zai No. 3 lu he Westminster,” on the phone to my rideshare, I get stunned reactions. I’m not fluent in Mandarin by any means; I can only say a few words, but I’m starting to feel foolish for not knowing more. I live in Vancouver, where Mandarin is the second most spoken language. I should not be the only white guy who can string a sentence together. At KPU, many of us have a foreign language component to our degrees, and while you’re here, I plead that you take it more seriously than as a means to earn a few measly credits. All of us had to study French in school, but barely any of us can speak it now. Even when I was six years old I found French to be useless on this side of the country, but ended up retaining most of it because I was in an immersion program for several years. The reality for most anglophones is that the pressing need to learn a second language simply doesn’t exist. Even when you travel to Europe, it’s easy to find others who speak English well, and in Germanic countries you can bet on almost everyone being able to speak it. In India, an estimated one in 10 people speak English at a high level. In China, getting a degree from Tsinghua and having great family connections is considered nearly pointless if you can’t speak English at meetings with North Americans or Europeans. So not only is it lucky to be born in Canada—it’s also beneficial to be monolingual in the one language that the rest of the world is trying their best to become conversational in. As for Vancouver specifically, a lack of bilingualism might be hurting us in the long run. In 2016, Edmonton had just over 2,000 elementary and high school students enrolled in Mandarin immersion programs. Vancouver had only 500. This is bad for our future economic success and, thankfully, some parents are raising hell over it. I know that it’s difficult to fully appreciate the language course you’re required to take, especially if you’re taking three or four other courses at the same time. Learning a language requires a consistent, thoughtful effort, especially if you’re not immersed. Learning a language in the classroom for three to four hours a week isn’t remotely comparable to the amount of time you spent on learning your first language as a baby. Moreover, if it’s a language you’re not passionate about, it’s pure drudgery. Learning a “difficult” language that you have a passion for is much, much easier than learning an “easy” one you don’t care about. This is why Japanese courses tend to be popular; with its three alphabets and unusual sentence structure, it’s easily one of the most difficult for anglophones. Still, Japan has immense geo-political soft power and many in the West find their films, video games, and culture intriguing. 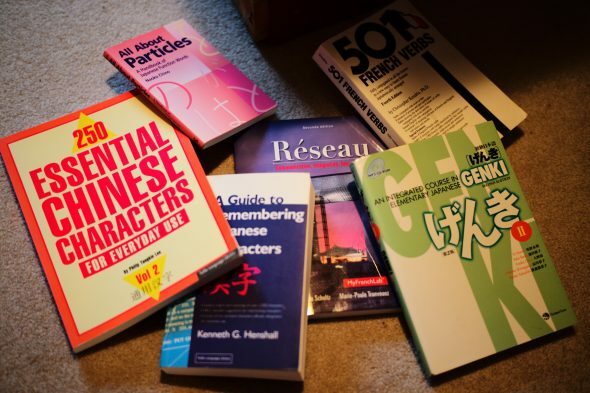 Learning a second language to an intermediate or advanced level will make you much more competitive in the job market. After all, in Vancouver, you’re competing against a city where one in three citizens don’t speak English at home. You’d be surprised where this might come in handy, and its utility isn’t limited to journalism or business students. A scientist would have access to more institutions, and a medical student would be able to serve more patients. There are also the numerous health benefits that come with bilingualism such as reduced risk of Alzheimer’s and improved brain function. I’d also argue that the ability to empathize is important. It’s certainly harder to be discriminatory towards a culture when you’ve spent years literally learning to speak their language. In our highly globalized world of cheap air travel and broad trade agreements, you’re not only competing to get a job with your classmates. You’re probably competing with someone from another country who has your skills plus two languages. Consider that the next time you think about ditching your language requirement class.